Nitrosamines are impurities that can show up in a wide array of cosmetics ingredients—including diethanolamine (DEA) and triethanolamine (TEA)—and products. The U.K.’s Department for Business, Enterprise and Regulatory Reform characterizes nitrosamines as toxic in more animal species than any other category of chemical carcinogen . 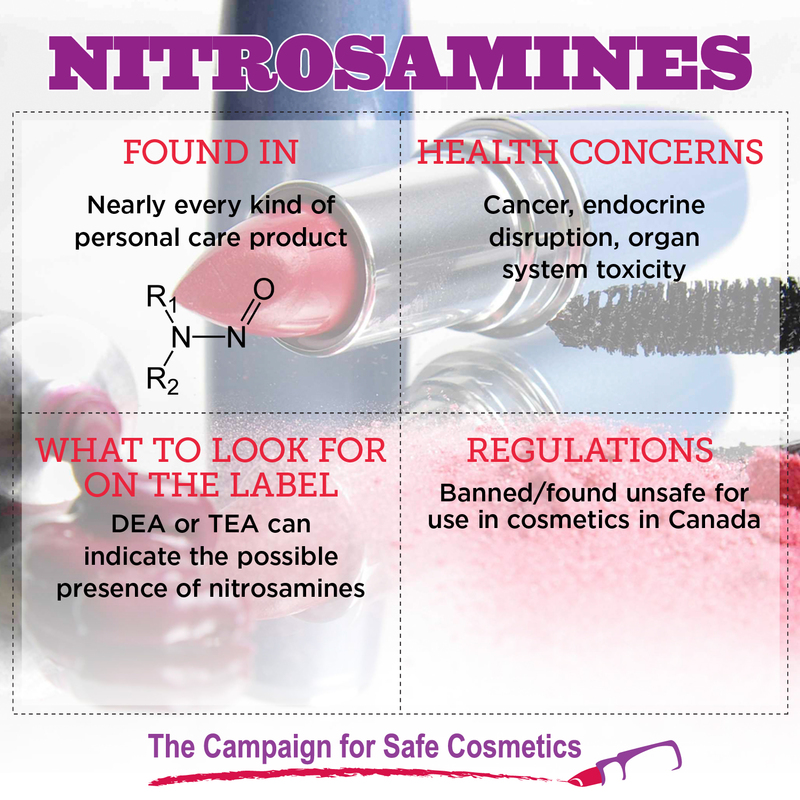 While common in cosmetics, nitrosamines are not listed on product labels because they are impurities, but avoiding products with DEA and TEA is a start. As these compounds break down over time, they can recombine into nitrosamines. DEA and TEA are additives commonly used in cosmetics to adjust the pH level or to act as wetting agents . Other ingredients with “amine” in the name (which indicates amino acids, or building blocks of proteins) can indicate the potential for nitrosamine contamination. 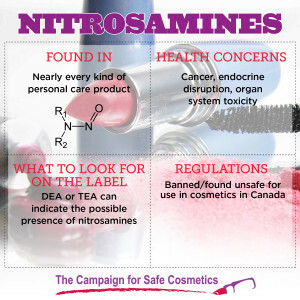 Nitrosamines can form in nearly every kind of personal care product, including mascara, concealer, conditioner, baby shampoo, pain-relief salve and sunless tanning lotion. Cancer: Numerous studies and databases link nitrosamines to cancer. They are listed as possible or known human carcinogens by the U.S. Environmental Protection Agency , the International Agency for Research on Cancer  and the U.S. National Toxicology Program . Several other databases cite strong to moderate evidence regarding the cancer-causing properties of nitrosamines. Endocrine disruption: There is some evidence of endocrine disruption at very low doses. Organ system toxicity: N-nitrosoethanolamine (NDELA), one form of nitrosamine, accumulates in the liver, bladder and other organs and leads to chronic toxic health effects. It is readily absorbed through the skin . Studies have also linked nitrosamines to developmental or reproductive toxicity, immunotoxicity, neurotoxicity and systemic toxicity. HOW TO AVOID: Because nitrosamines are created by reactions of chemical mixtures in products and therefore are not on the ingredient label, consumers cannot easily tell which products contain them. A good start is to avoid products with DEA, TEA and other ethanolamine compoundssince these contribute to nitrosamine formation. The FDA began watching personal care products for nitrosamines in 1979, and published a report stating that products containing nitrosamines could be seen as adulterated and subject to FDA enforcement. This led to a striking drop (from 150 ppm to 3 ppm) in concentrations in one form of nitrosamine-n-nitrosoethanolamine (NDELA) in testing 12 years later . In 1996, the FDA encouraged cosmetics manufacturers to voluntarily remove ingredients that could combine to form NDELA and to conduct testing to understand why cosmetics become contaminated with NDELA. Despite these encouragements, the Environmental Working Group found that one in every 10 products contains ingredients that can combine with others to form nitrosamines. A 1998 study by the U.K.’s Department of Trade and Industry showed that nitrosamine levels in some products actually increase in the months after a product is opened . Agents Classified by the IARC Monographs, Volumes 1–109 [Online]. Available online: http://monographs.iarc.fr/ENG/Classification/ClassificationsAlphaOrder.pdf. Accessed November 5, 2013. Report on Carcinogens, Twelfth Edition (2011) [Online]. Available online: http://ntp.niehs.nih.gov/ntp/roc/twelfth/profiles/Nitrosamines.pdf. Accessed November 5, 2013. Matyaska MT, Pesek JJ, Yang L (2000). Screening method for determining the presence of N-nitrosadiethanolamine in cosmetics by opn-tubular capillary electrochromatography. Journal of Chromatography A. 887: 497-503. Environmental Working Group (2007). Impurities of Concern in Personal Care Products. Available online: www.cosmeticsdatabase.com/research/impurities.php. Accessed July 28, 2008.